We couldn't be more excited about our newest product launch! We've said it once and we'll say it again, every room needs a vintage piece! They bring depth, warmth, and character to your space. After hand selecting fresh vintage patterns that are relevant to design today, we made them into one-of-a-kind pillows! Each pillow has it's own character and beauty, making a beautiful addition to your home. Shop the collection now! The striped hemp was created on a hand loom in a Chinese Hill Tribe. Its authenticity is evident in its thick threading and sophisticated striped pattern, providing incredible texture and vintage character all in a pillow. The mudcloth pillow comes from vintage African hand-loomed cotton strip cloth, sourced from the 1950s. Its tribal pattern in warm fawn and ivory carries a faded quality that is evidence of its authenticity, while making it a one-of-a-kind neutral. More than just a neutral, the Tribal pillow features a hard-to-find taupe and ivory palette, created through authentic mud dying techniques in Mali, Africa. Sourced from the 1950s, this textile has been kept in incredible condition with no staining, yet still bears the unique character we love to see in a vintage piece. Every room deserves at least one vintage piece, and the Ikat pillow bears an especially unique history. This textile was originally a vintage corte that would’ve been worn by a Guatemalan village woman. 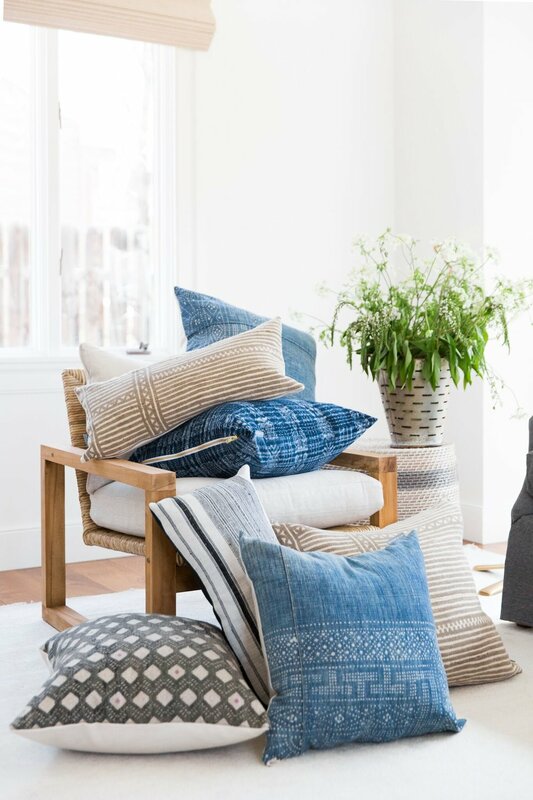 Not only soft, but sturdy, the Ikat pillow’s indigo blue weave includes dark and light shades, and clean white–– all crafted by hand on a Guatemalan loom. Just as its name suggests, the Batik pillow was hand-batik dyed, using all-natural indigo coloring. This Chinese fabric is sourced from the 1930s and carries all the characteristics we love to see in true vintage textiles: time worn character, hand-stitching, and a one-of-a-kind pattern. The Embroidered pillow was hand-loomed in the 1950s as a Chinese hill tribe wedding blanket. Bring the unique history of this textile home as pillow with its gray-green stitching and pink accents that add to its rare character.